Technically there´s no difference to the standard version. The standard version is also offered furthermore. All new versions of the firmware will work on all Sys-Check versions and revisions like ever promised. While Sys-Check V2.2 "Standard" remains usable for all Atari XL computers (except 1200XL) and all XE computers with ECI-Port, the new versions are specialised for XL or XE models only. 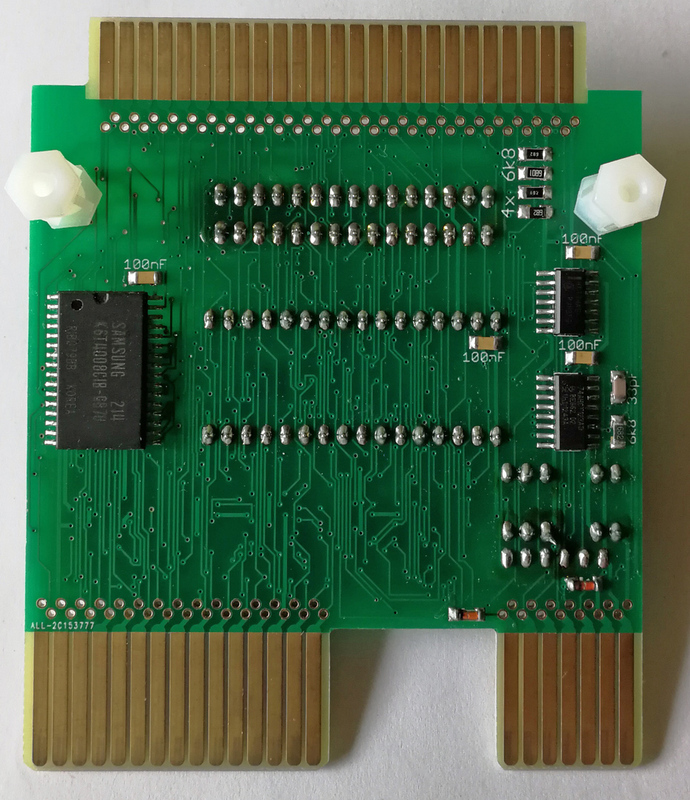 Both new solutions have distance bolts to have the PCB secured for continuous usage - a lot of users of Sys-Check reported me they never use it for diagnostics, but main time for external memory expansion or a different O.S. like for SIO2BT and others. 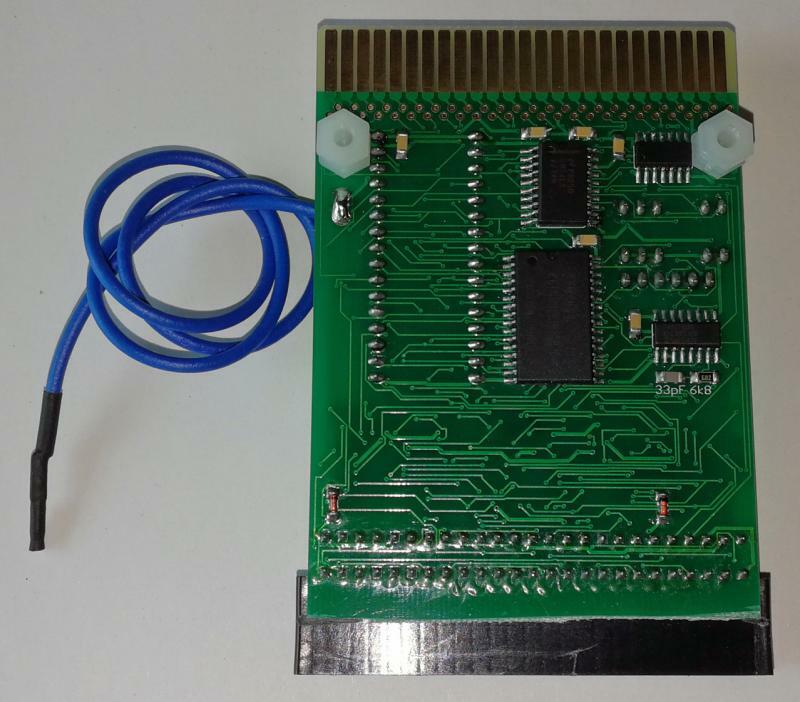 The PBI connector at the end of the PCB is a 1:1 connection to the computer´s PBI. You can plug, for example, the Turbo Freezer 2011 behind Sys-Check XL and it will work. Of course you got problems when you enable OLD-OS or the memory expansion at the Turbo Freezer device AND also enable OS-ROM external support by Sys-Check and/or the memory expansion by Sys-Check. Only one external OS or one external memory expansion should be enabled. The XE version has a PBI connector, which is mostly 1:1 compatible to the XL PBI. There are four signals, which aren´t existing at the XE ECI connector: RAS, CAS, EXTENB and RDY (Ready). These signals have a 6k8 pull-up resistor each to gain maximum compatibility. The most actual PBI devices don´t need one of these four signals and run fine. 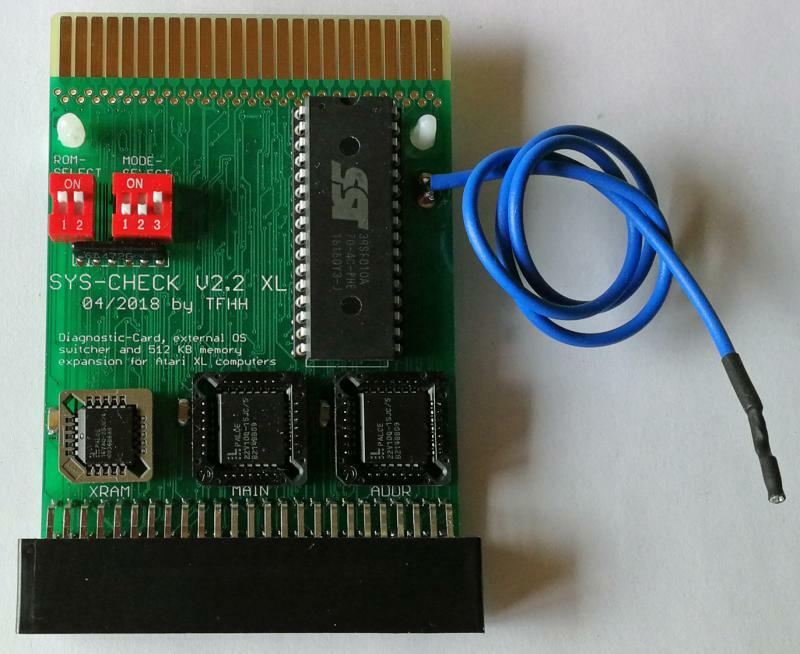 I found only the older Turbo Freezer II with DRAM memory expansion, which won´t run, because it needs RAS for the memory expansion part. But maybe more old PBI devices won´t run. This limitation always exists on any XE ECI to PBI adapters. Very nice! I would have gotten the new XL version, if it existed when I bought my Sys-check because I would prefer it laying flat too. But, I have the original and have been planning on swapping out the connector myself for a right angled one to make it sit like the new XL version myself. Also make a case for it. I will probably buy the new XL version too, eventually, if you still have them when the time comes, mainly for the pass-thru properties for a computer I plan on using and IDE 2.0 for eventually, and keep the original connected to a computer that uses other "HD" solutions like MyIDE II. a valuable piece of kit - highly recommended for repair diagnosis but with an added bonus RAM expansion! I will probably buy the new XL version too, eventually, if you still have them when the time comes, mainly for the pass-thru properties for a computer I plan on using and IDE 2.0 for eventually, and keep the original connected to a computer that uses other "HD" solutions like MyIDE II. Congrats! I bought one of the "old ones" some weeks ago and can recommend these for anybody regardless of the purpose. i recommend it as well. 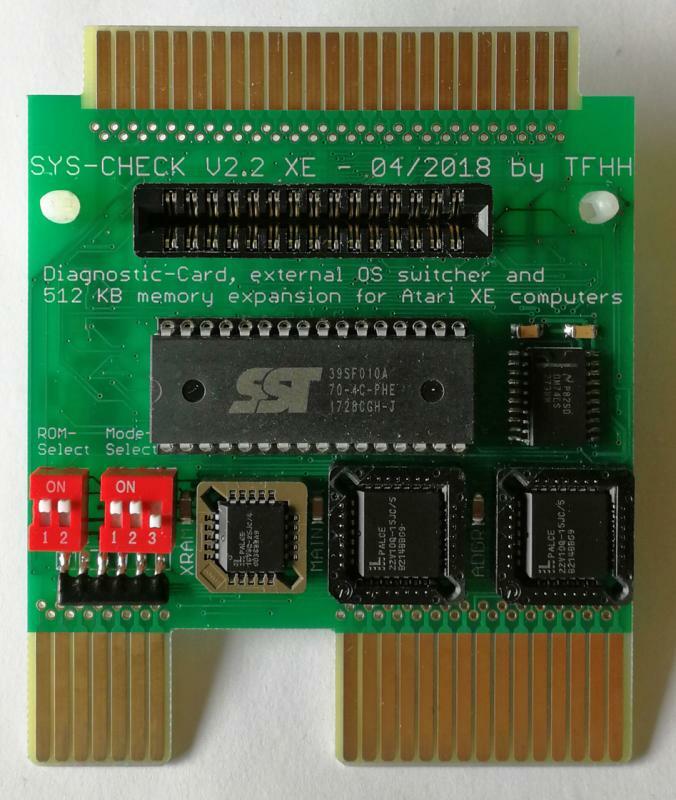 I have the original syscheck2.2 and it has come in very handy for diagnosing and isolating memory issues on multiple systems, which is why i bought it. But the added bonus of an alternate OS switcher is awesome, and turns out that's what I actually use it for most of the time! Edited by erichenneke, Fri May 11, 2018 8:17 PM. I use the 'older' version all the time. Highly recommend Syscheck as an essential troubleshooting tool. Theoretically it should work, but I´m not sure (and haven´t tried it yet). Incognito is based mostly on the Ultimate 1 MB. The U1MB has the REFRESH (REF) signal attached at the Xilinx CPLD and in fact that U1MB emulates the MMU also I assume that U1MB would suspend all activities when REF = low. So Sys-Check as the Turbo Freezer works fine with U1MB. But, Incognito replaces not only the expansion memory, also the standard memory. So there´s no need to recognize the REF signal anymore, because Incognito controls everything. When Sebastian left the logic terms regarding REF in Incognito´s CPLD program code and REF is attached to the IDC header (PBI), then it should work. I asked him this several years (...) ago, but didn´t get any answers to my emails. THANKS for the detailed, obscurantism-free response!!! I would like to try it out on my Incognito setup (I have back-up Incognitos, so we are covered). It does. This is how I managed to connect IDE Plus 2.0 and the Turbo Freezer to an Incognito machine in the past. Secondary 50 way male headers on PBI devices are rather handy in this respect (also for my 1200XL, which uses a completely non-standard PBI connector). Using or extending SysCheck to also diagnose / test Incognito sounds like a wonderful / logical idea, to me, considering how NICE and smart SysCheck is on its own!! !